We’d love your help. Let us know what’s wrong with this preview of The Game by A.V. Dalcourt. The Game: Beta Testing is an 8,000 word short story. Once a year, the Council frees up the media broadcast to feature government approved entertainment that is put on by various schools in an effort to draw in additional funds for educational purposes. However, not all students are fighting for a piece of the limelight. A reluctant Seth Wright is thrust into the hero’s role The Game: Beta Testing is an 8,000 word short story. To ask other readers questions about The Game, please sign up. When we think about education and high school, our minds often picture studying and sitting through classroom lectures. However, perhaps the most exciting things which happen for most students in high school occur outside of the classroom. Indeed, the many clubs and teams which are offered in schools are frequently the memories which people will recall the best and the most fondly. One such activity which garners a lot of interest and keen excitement in most schools is the Drama Club. In her When we think about education and high school, our minds often picture studying and sitting through classroom lectures. However, perhaps the most exciting things which happen for most students in high school occur outside of the classroom. Indeed, the many clubs and teams which are offered in schools are frequently the memories which people will recall the best and the most fondly. One such activity which garners a lot of interest and keen excitement in most schools is the Drama Club. In her novel, The Game: Beta Testing, A. Dalcourt captures the buzz and thrill which typically surrounds dramatic productions in the school setting. However, in this short story, things are not always as they seem. If you enjoy tales which alternate between theatrical reality and vivid imagination, then this story may be precisely what you are looking for! Essentially, the tale begins with a room full of people nervously preparing to broadcast their school play across the country. The stakes are high as the performances are government sponsored and a method of fundraising for cash starved schools. A great performance will mean a large sum of money for lucky schools, while a poor or lacklustre play will lead to the opposite. To make this production even more interesting, it is a Virtual Reality performance and real people are thrust into the limelight in a digital world. At the center of this setup is Seth Wright who is the reluctant hero of the story. He will be forced to “perform” in this Virtual Reality play which has many more elements of “reality” than “virtual”! He will soon see himself and his other cast members struggle for their very survival in a world of dragons, savage dogs and wizards. Will Seth and his crew survive to perform another day? Or will this virtually be “game over’? 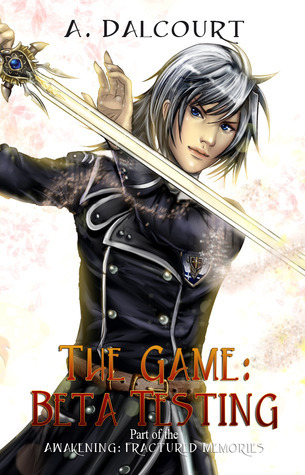 The Game: Beta Testing is actually a short story which is part of the author’s Awakening: Fractured Memories Series. There can be little doubt that it was written for a young audience and relies heavily upon themes of fantasy, technology and the pursuit of quests. In many ways the plot of the story resembles a life-like video game. It is a great tale for the intended audience. However, for those who are not as well versed in Role Playing video games, the plot can be difficult to follow at times. Although I am quite familiar with Role Playing Games (RPG) myself, I still found the storyline hard to follow as it was difficult to distinguish the reality from the performance. That could very well have been the author’s intention, but I do feel it obstructed the flow of the story. In regards to character development, it was a rather short tale so the characters were not developed in excessive detail. Seth Wright does make a convincing, yet reluctant, hero however. He is someone who is put into a situation against his will or better judgement. Despite this, he manages to fight and survive and develops into a much stronger character by the end of the story. Also, the character of William is cleverly presented effectively in juxtaposition to Seth. He is believable as a selfish, cowardly and somewhat despicable character who helps to project Seth into an even brighter role. Overall I would recommend this story for a young audience. There is nothing overtly sexual in the tale, nor is there anything different from what you would see in a typical P.G. rated video game. Older readers may enjoy it as well if they are familiar with the technology and quest-like theme. It is heavily entrenched in fantasy, and for that reason alone it may be a good read for lovers of that genre. I personally struggled with it at times and for that reasons give it 3 out of 5 stars. Amber Dalcourt was convinced that her family home was haunted. Surrounded by storytellers and half a family tree steeped in mythology, lore and superstition, she drew on her occult heritage to conjure up demons, ghosts and things that go bump-in-the-night to fill the pages of her imaginary world. A self-proclaimed lazy perfectionist, she would often lose herself in deep, multi-level stories throug Amber Dalcourt was convinced that her family home was haunted. Surrounded by storytellers and half a family tree steeped in mythology, lore and superstition, she drew on her occult heritage to conjure up demons, ghosts and things that go bump-in-the-night to fill the pages of her imaginary world. A self-proclaimed lazy perfectionist, she would often lose herself in deep, multi-level stories through gaming and fantasy novels. Early on, she was mesmerized by the power of the written word and visual storytelling, shaping her career in Design and Animation around it.